A vibrant, Pinotage with chocolate, plum and dark cherry aromas that follow through on the palate. A well-integrated wine with firm dark chocolate tannin. The grapes were hand harvested in the middle of March 2015. The intensely flavoured and impressively pigmented bunches were taken directly to specialized red wine fermentors for an overnight 'cold-soak'. This allows for colour extraction early on in the winemaking process. Fermentation took place with temperatures peaking at 25ºC. The wine was pressed off the skins directly after fermentation. Following malolactic fermentation, it was matured for 6 months on French Oak staves. Situated on the Stellenbosch Wine Route, Zevenwacht has viticultural roots which penetrate deep into the historic part of South Africa. While literally meaning Seven Expectations, the name Zevenwacht exemplifies the abundant delights which await visitors to the Farm. A leader in wine tourism, Zevenwacht was one of the first Wine Estates to establish a restaurant, hotel and conference facility, Cheesery and Spa on the Estate. From Anonymous of Hartford , Connecticut on 11/26/2018 . 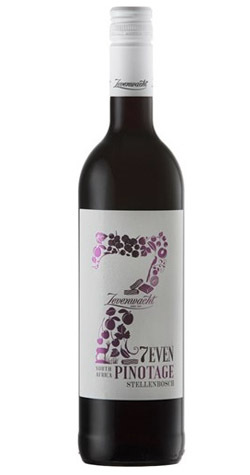 In addition to it being from a beautiful winery, Zevenwacht’s 7even Pinotage is simply terrific and a super value. We highly recommend this wine.